 "68 meticulously transcribed and beautifully printed tunes (complete with melody, chord changes, and subsidiary lines) taken from, or in the tradition of, the hard bop Blue Note recordings of the 1950s and 1960s." 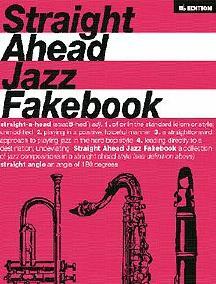 Straight ahead is a term jazz musicians use in a variety of contexts. 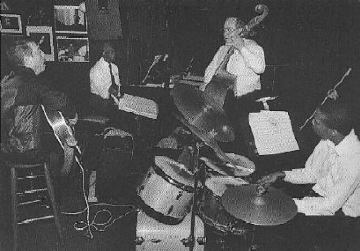 When jazz musicians describe a rhythm section as straight ahead, they are alluding to a drummer playing the typical chang chang che chang cymbal figure and a "walking" bassist supporting the groove with quarter notes and a few triplet figures thrown in for contrast. For at least half of an evening's performance, the rhythm section is in a swing mode. The drummer is playing the characteristic ride cymbal figure, the bassist is walking, and triplets are the dominant rhythm. Interspersed are a few pieces, or sections within pieces, based on Latin and funk rhythms. Although musicians may not explicitly label it as such, it is easy to speak of straight ahead jazz instrumentation acoustic bass, a drumset with a small bass drum and instruments suitable for bebop such as saxophone, trumpet and acoustic piano. Like other labels, "straight ahead" tells more about what it is not rather than what it is. Since the 1970s, the term has been used to distinguish contemporary jazz that is neither jazz-rock (fusion) nor avant-garde (free) jazz. For example, straight ahead jazz does not refer to the music of Spyro Gyra, David Sanborn, Ornette Coleman, the World Saxophone Quartet, or Cecil Taylor. With some minor quibbling, most jazz critics would agree that the composers represented in this collection write in a straight ahead style. Straight ahead jazz has a few characteristic structural components. A straight ahead jazz melody is often modeled on the formats of American popular songs of the pre-rock era. The most typical is a 32-measure structure with an eight-measure theme (A) repeated, followed by a contrasting passage (B) called the bridge and a reprise of the A theme. The typical straight ahead jazz performance consists of a melody followed by improvisation on its chord changes. After the improvised solos, the melody is repeated. In several compositions, the melody is followed by a reprise of the introduction. Some of the compositions in this book go beyond these structural bounds. But one gets the sense that these are variations upon the form, rather than a distinct new approach. Many of the compositions in this book were recorded on the Blue Note label in the l950s and 1960s. During this period, the label became the most important source of hard bop jazz by promoting the music of Art Blakey, Horace Silver and the former sidemen of these two musicians. By concentrating on this pool of talented musicians and giving them artistic freedom the Blue Note sound developed a tough sound with a hard, driving beat. For a comprehensive discussion of the hard bop style, see the Introduction to Hard Bop Piano: Jazz Compositions of the 50s and 60s (Gerard and Sarzin Publishing Co., 1992). I have included works by Hal Galper, Tom Harrell and Mulgrew Miller three outstanding composers active in jazz today. In contrast to most jazz fakebooks in which only the melody line appears, this book provides musicians with essential subsidiary lines so they can make these pieces sound the way they were recorded. The compositions are in lead sheet style, with chord changes placed above the measure. These changes are used for improvising. Substitute changes appearing between double staves are to be played only with the written music. Tom Harrell, Mulgrew Miller and Hal Galper supplied me with lead sheets. The rest of the pieces were transcribed from recordings. Almost all the compositions receive their first printing here. Evan Sarzin and I wish to give special thanks to Jamey Aebersold, John McNeil and Carl Johnson of Music Publishing Services (New York City) for their invaluable help.